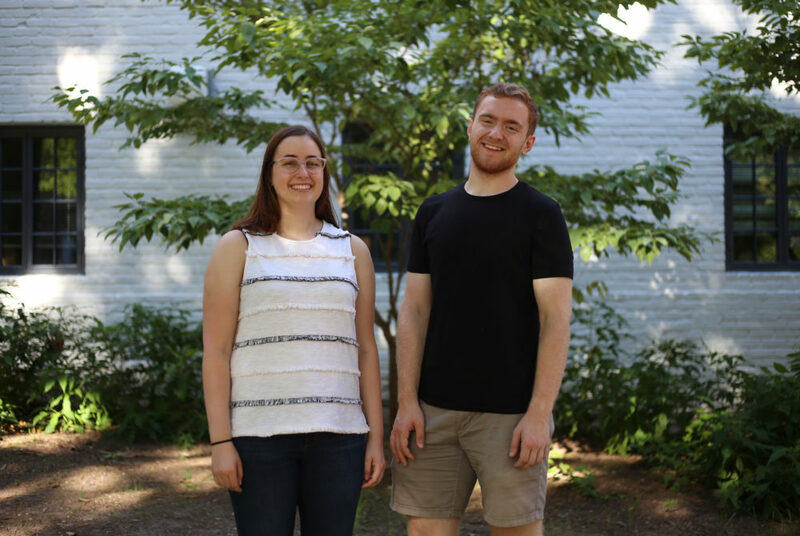 Eleanor Rubin and Jake Kania are the two coordinators for the senior class gift. With six weeks left for seniors to make their donations to the senior class gift campaign, organizers are hoping students involved in fraternities and sororities will participate in a matching challenge that donates money to Greek-letter organizations. The senior class gift coordinators announced in a Facebook post last week that a donor will give $10 to students’ Greek-letter organizations if they make a gift to the campaign by April 10. The campaign is the latest of several matching challenges offered during the senior class gift campaign in recent years – a trend other gift coordinators said indicates the success of campaigns that seem to stretch students’ dollars across multiple groups or departments. “You guys might know the deal by now; any gift, any size, and you’ll not only give back to what you care about on campus, but you’ll be supporting your Greek life organization too,” the Facebook post said. University President Thomas LeBlanc spearheaded a matching challenge last year, pledging to donate $1,000 for every 1 percent of the senior class that made a recurring donation. Three years prior, an anonymous donor matched gifts up to $3,000 for the Class of 2015. Alumnus Dylan Pyne, who donated the funds for the matching challenge, said campaign coordinators emailed him a few months ago inquiring about a donation after meeting him during an event at Colonials Weekend in the fall. Pyne, who declined to say how much he donated, graduated from GW in 2012 with a Bachelor of Arts in American studies and political science. Pyne said the gift was the first financial contribution he has made to GW even though he has remained involved with the University as the chairman of the steering committee of the New York Young Alumni Network for the past four years. The alumnus said he donated because tuition cannot support all of the University’s programs and initiatives, leaving room for philanthropists to step in and provide additional funds. He wants to inspire seniors to give before they leave GW to ensure future classes have the best experience possible, he said. “If it wasn’t for the generous alumni donors and volunteers who came before me, I understand my GW experience wouldn’t have been as positive and impactful as it was,” Pyne said in a Facebook message. Pyne said he chose to participate in a matching challenge specific to Greek-letter organizations because he was a member of Delta Tau Delta during his time as an undergraduate. His membership in the fraternity shaped his personal and professional life, both through the leadership skills he developed and the relationships he built, he said. University spokeswoman Maralee Csellar said the University is “grateful” for Pyne’s donation. Eleanor Rubin and Jake Kania, the senior class gift coordinators, did not return multiple requests for comment. Officials who head senior class gift campaigns at other universities said matching challenges – especially those that benefit specific student organizations – can make students feel like their donations are more impactful and encourage more seniors to participate. Kasia Jaworski, the senior class gift coordinator at Villanova University, said matching challenges keep alumni, who often fund matching challenges, engaged with the school. Caroline Blanchard, an organizer at Elon University’s senior class gift campaign, said most donors and students enjoy giving to matching challenges because they feel like their donation is worth more than its actual dollar amount. “I think one of the biggest perks is that students or donors are able to go further, a little bit more of an impact,” she said. Andrew Foiles, an organizer for Virginia Tech’s senior class gift campaign, said the Greek life community is a natural partner for university development officers because members of fraternities and sororities are likely more involved in campus activities and have closer ties to GW than the average student. But he warned that running challenges late in the spring runs the risk of flopping as students are overwhelmed by other fundraisers that launch toward the end of the academic year. This article appeared in the April 4, 2019 issue of the Hatchet.